Charity Events in or near Bergvliet, Constantia Valley in Cape Town, South Africa. Gifts galore lie in wait to be discovered at the Simply South Gift & Craft Fair. This is an indoor fair that takes place at the NG Kerk in Bergvliet, where the traffic circle (or roundabout) is perched on Ladies’ Mile Road. 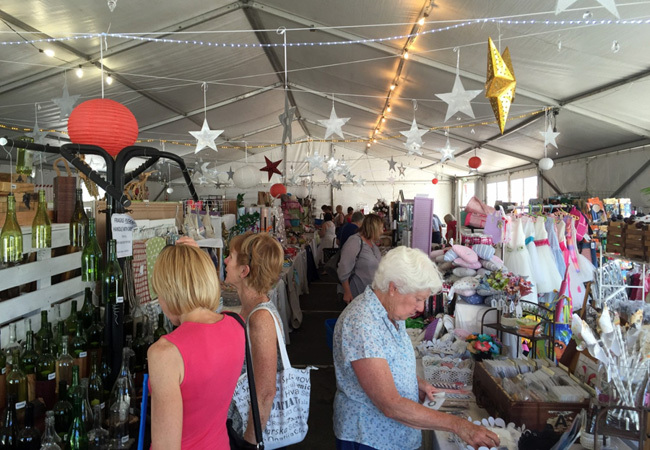 The Simply South Gift & Craft Fair is a delight for shoppers looking to stock up on goodies just in time for the holidays at the end of the year. But, more than this, it is a great place for families and groups of friends to peruse the more than 200 stalls and to glean ideas and inspiration from these talented folk. The crafters and the creators of the delectable meals on offer come from all over the Western Cape, keen to meet locals and visitors. The craft stalls showcase a range of products that include jewellery, fabric crafts, wooden items, beadwork, stationery, pottery, glassware, and even natural body and health products. In addition, there will be aluminium homeware, and a unique collection of handmade cutlery. These make for stunning gifts for those that appreciate handmade arts and crafts, and for unique items in the wardrobe and home. Of course, the food at these kinds of events is always one of the main delights, as hungry shoppers get to sample a range of flavours. This year, there will be a variety of preserves, sauces, dried fruit, nuts, olives, biscuits, indulgent fudge, and authentic fruit cakes that are always popular around Christmas time. The market will be open every day, and there will be a raffle that runs for the duration of the fair. The proceeds will be donated to Imbali and St Jones House. There is no entrance fee, and visitors can be assured of plenty of parking. Credit card and debit card facilities are available. Venue: You can find us at NG Kerk Constantia, Cnr Ladies Mile Road and Firgrove Road, Bergvliet.